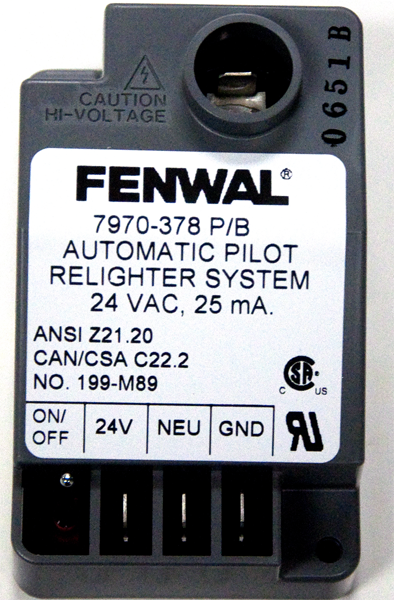 Pilot Relighter Controller used in Coleman; Evcon equipment. Replaces Part Numbers: 7970-378P/B; 7970378P/B; 7970378PB; 7970-378; 7970378; 7970-378P/A; 7970378P/A; 7970378PA; 7970-378P; 7970378P; 7970-3781; 79703781. Used in Coleman; Evcon Models: 7956-759/E; 7970-759/E; 7975-759/E; DGRM056AUA; DGRM056AUB; DGRM075AUA; DGRM075AUB; DGRT056AUA; DGRT056AUB; DGRT070AUA; DGRT070AUB; DGRT075AUA; DGRT075AUB; DLRS056AUA; DLRS056AUB; DLRS070AUA; DLRS070AUB; DLRS075AUA; DLRS075AUB.